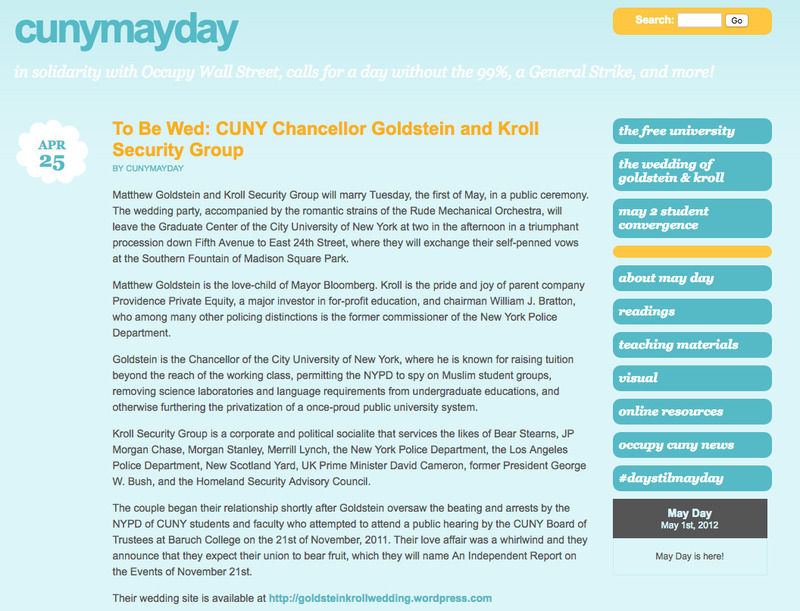 This blog from 2012 features posts and resources regarding that year's May Day activities on and around CUNY campuses. Among these resources are flyers, sample lesson plans, and readings intended to raise awareness around issues facing CUNY and the larger community. The efforts were part of the "Occupy CUNY" movement, an offshoot of the Occupy Wall Street campaign of 2011. Rights | Copyright CUNY May Day Blog This work is licensed under a Creative Commons Attribution-NonCommercial-ShareAlike 4.0 International License. Cite This document | Unknown, “CUNY May Day Blog,” CUNY Digital History Archive, accessed April 18, 2019, http://cdha.cuny.edu/items/show/6732.